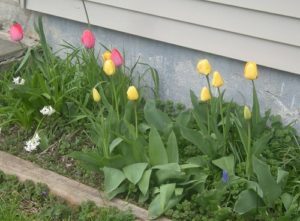 Here are some views of the animals on the farm – goats, cows, pigs, calf, and chickens – and a look at the tulips, opened and closed. Enjoy! 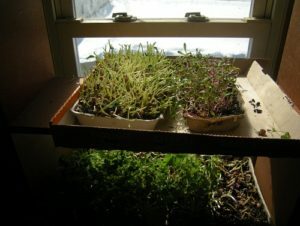 March is time to start some seeds! So far this year we have started tomatoes, gourds, and rosemary. We built a little plant nursery in our basement a few years ago that we raise our plants in. A string of outdoor Christmas lights are in the bottom to keep the soil warm. And overhead lights are on a timer to simulate sunlight. 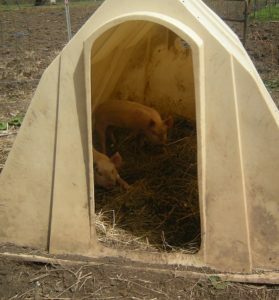 The plastic tent covering can be peeled back into a large opening. This lets us soak everything well with a hand sprayer. Hopefully these young tomato plants will be producing fruit later this summer. 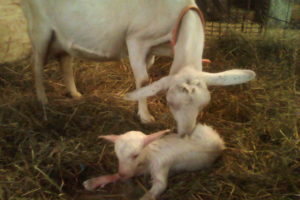 Late last fall we decided to re-try our hand at raising some goats. 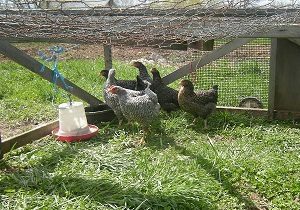 We bought a fine Nubian-Saanen cross, named Pesch, from farmers we know in Cortland County. 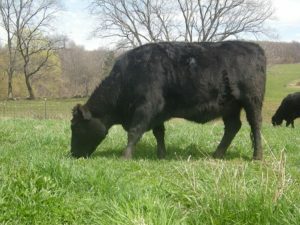 She had been bred and expected to deliver in March. Well, deliver she did…and along came kid number 1. 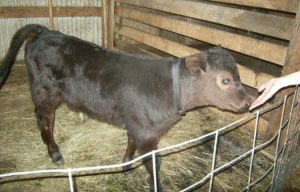 And then along came kid number 2. 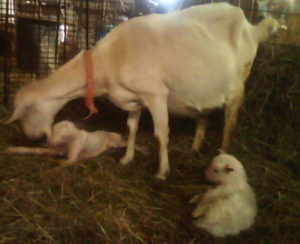 And the out popped kid number 3. All was going well with our three little kids. And then we tried to follow good veterinary practice and gave them a booster shot of selenium and Vitamin E. Unfortunately, we got our dosage wrong and thus we arrive at our iatrogenic issue. Two of the kids reacted to the overdose and ended up dying. 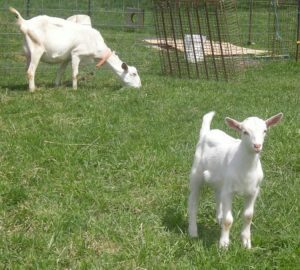 It was a sad re-introduction to raising goats, but we are glad that we have one little guy (the kids call him Ralph) that jumps around the pen playing with Mama. March 23 – Once upon a time (heigh-ho, the dairy-o) the Farmer took a wife. The Farmer’s Wife not only gets to cook all the great farm food, but also helps keep track of farm records. This is in addition to volunteering for her church, working part-time for a small homeschool curriculum producer, homeschooling her children, and maintaining a household. And the big push now is to get our tax forms done. 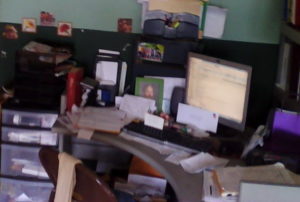 Here is The Farmer’s Wife’s Nerve Center. Does that look like organized chaos? 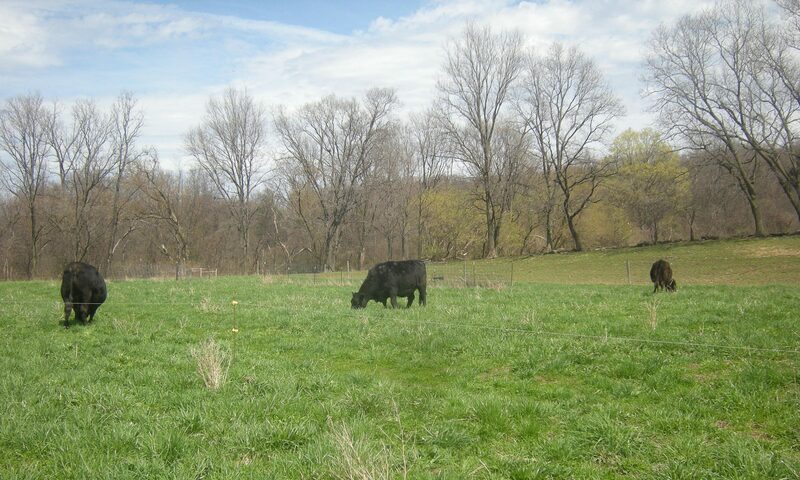 Well, if The Farmer posted a picture of his work area, you would see complete chaos. 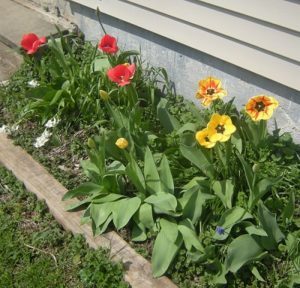 April 8 – And taxes are done, submitted, and accepted! YEA!!! 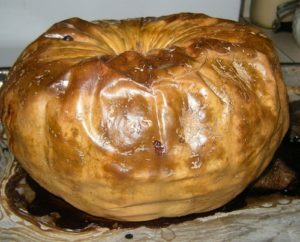 Here is my favorite pumpkin pie recipe. It came from the back of a no-name brand of canned pumpkin. 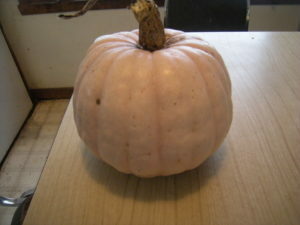 I cook down my pumpkin and use that in place of the canned pumpkin. This pumpkin pie uses milk, eggs, pumpkin, sugar and spices, nice and straightforward. Mix pumpkin, sugar, spices and eggs together. Stir in milk. Pour into 2 uncooked pie crusts. Bake for 400F until knife comes out clean. It may take 1 1/2 to 2 hours. Cool and eat. I use something between 3 and 4 cups of pumpkin, depending on how much I have. Nutmeg or pumpkin pie spice can be substituted for some of these spices. Here is the pie crust recipe that I like to use. Enjoy! First I washed the outside of the pumpkin. I poked it 3 or 4 times with a fork. Next I put it on a pan with sides and put some water in the bottom. I baked it at 400F until it was soft, probably about 2 hours. I removed it from the oven and let it cool. Then I peeled it. Next I cut it into pieces and put about 4 cups in the blender. I added water to the top of the pumpkin. I blended it until I had a nice puree. Then I set it aside and blended some more. Once it was all blended I could use it or refrigerate or freeze it until I had something to do with it. 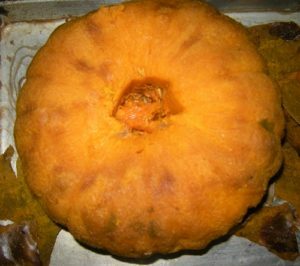 Here is a way to cook a pumpkin or winter squash in the oven. 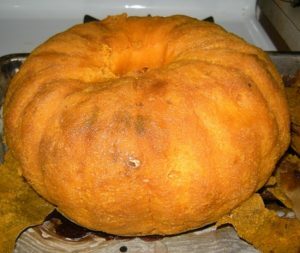 Wash the outside of the pumpkin, poke it with a fork 3-4 times, put in a pan with sides, like a 13x9 pan, cover the bottom with water, put in the oven, bake at 400F. Cook until it is soft. This could take 2 hours. I check it at 1 hour and every 15-20 minutes after that. It will feel soft and it could shrink and sort of fall in on itself. Once it is soft, remove from the oven and let it cool at least 10-15 minutes. Cut it open. If it is still hot inside, let it cool some more. Once it is cool enough to handle, remove and discard the seeds. 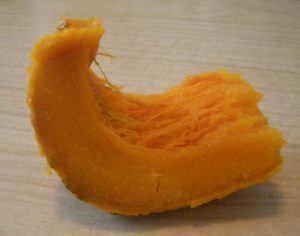 Pull off the skin or scoop out the meat of the pumpkin. 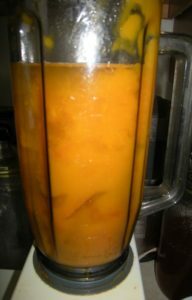 Put about 4 cups of pumpkin in the blender. Add water to the top of the pumpkin. Blend until smooth. Add water if all of it can't rotate through the blending. Empty the blender and do another batch, repeating until it is completed. Refrigerate or freeze until you are ready to use it. Shave steaks are thinly sliced steaks, cut from sirlion tips. If used for sandwiches, 2 steaks take about 5 minutes or less to cook. This batch of shave steaks has 8 steaks in a package and the package weighs about 1 lb. We eat the steaks on rolls with lettuce, cheese, tomato, and condiments. Here is how I cook them: I put 2 shave steaks on a skillet over medium heat. They will start cooking and will visibly shrink. They will also turn gray/brown and will have red liquid sort of pool on top. At that point I flip them over and cook the other side. If red liquid comes up again, then I flip them one more time. And usually then they are done. I remove them to a plate and do 2 more. 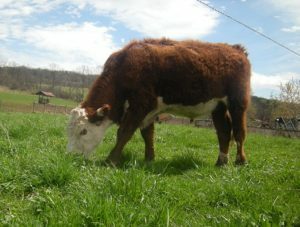 This is the meat that you would make a Philly Sandwich with. You can also cut the uncooked meat into small squares and use as the meat of a stir fry. Enjoy! 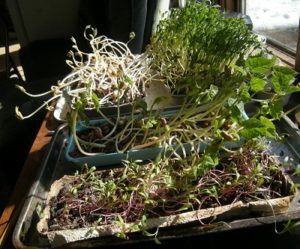 We are in our 3rd year of growing soil-sprouted greens during the winter. Here is the page describing the process. We are using paper egg cartons to hold the dirt and we set these on trays to protect the shelf or table surface. 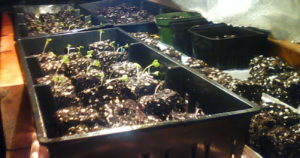 In addition to sprouting peas, we are sprouting other seeds, including beets/Swiss chard and beans. Peas are still our preferred sprout, but the others give a variety of flavors. We have a multishelf in a sunny window. After our first harvest, we let the sprouts grow a 2nd time. Some resprout. Others weren’t harvested the first time and are the 2nd time. After the 2nd harvest, the whole container is composted. The Farmer plans his summer pea bed for at least 2 fifty-foot rows. One row will be for us to eat as a raw or cooked veggie. The other will go to seed. He will save some of the seed to plant the next summer and will save most of it for us to sprout in the winter. Gray Dwarf is the current variety we are sprouting. Recently I made this tasty chuck roast in the crockpot. It has a mustard, maple syrup and vinegar sauce to flavor it. It is based on this recipe. This recipe is based on this recipe from the Kitchn. Set a large Dutch oven or heavy skillet over medium-high to high heat. Sear both sides of roast until golden-brown, about 10 minutes per side. Transfer the roast to a 6-quart crockpot. Reduce heat to medium. Add the onions and/or other vegetables and cook until starting to soften, about 5 minutes. Pour in a few tablespoons of chicken broth and bring to a boil, scraping up any of the brown bits from the bottom of the pan. Pour the onions and pan juices into the bowl of the slow cooker. In a separate bowl, whisk the remaining chicken broth, mustard, maple syrup, vinegar, paprika, salt, and pepper until combined. Pour the liquid mixture over the roast. Cover and cook on the LOW setting until the meat falls apart and is meltingly tender, about 8 hours. If you only have 6 hours, you can do this 3 hours on high and 3 hours on low and it will still turn out fine. If you only have 2 hours, see Dutch oven directions below. Transfer the roast to a serving bowl or platter and let it rest for 5-10 minutes. Cut the roast into chunks or shred the meat and add back to the liquid. Serve over rice, potatoes, or bread. Bacon - Before searing the meat, replace the fat with 4-5 slices of diced bacon. Cook it until some fat starts rendering and it begins to turn golden-brown. Push the bacon to the sides and add the beef and sear it. Gravy - Pour the cooking liquid into large saucepan and bring to a boil. Cook until the gravy is reduced to desired thickness. 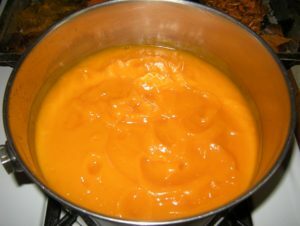 OR Once the sauce boils add flour dissolved in water (1/2 cup water with 1/4 flour dissolved in it) and stir until it is thickened. Return gravy to crockpot and add chopped meat. Dutch oven - (Not tested yet, but I like the idea!) Prepare the meat for the pot roast in the bottom of a Dutch oven, then place all the ingredients on top of the seared roast. Cover and bring to boil. Then either simmer over very low heat OR cook in a 325°F oven until the pot roast is tender. Cooking time will be reduced, so begin checking the roast after about 2 hours.